There are over 519 million Black Women on the planet Earth, give or take a dozen. There�s a Black Woman on each of the seven continents, in almost every country and in almost every context. There are even Black Women in the space program. So no matter where you go, she�s already been there. She travels with forces greater than herself. Her presence is everywhere. 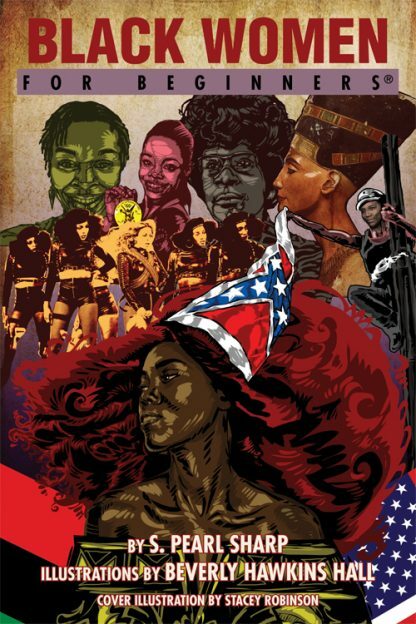 Black Women For Beginners is a documentary comic book that chronicles the trials and triumphs of Black Women from antiquity to the present, reflecting with wit and humor the challenges they have faced and the fortitude and strength that have sustained Black Women and patterned history with a diversity of excellence. As warriors, healers, teachers, mothers, queens, and liberators Black Women have had tremendous impact on issues from food to fashion, from politics to poetry. Replete with a glossary of reference terms, Black Women For Beginners whimsically details the influence of stereotypes on the portrayal of Black Women in various venues and punctuates the absurd. An award-winning independent filmmaker,Sharp's documentary films include The Healing Passage/ Voices From The Water, which aired on The Documentary Channel, Life Is A Saxophone, on poet Kamau Daáood, and cultural arts documentaries for the City of Los Angeles CH 35. S. Pearl facilitates workshops connecting language and wellness & offers creativity coaching through The Gate Is Open.